In order for us to create documents in QuickBooks Online, you'll need to have your inventory created and configured. Without inventory items, we won't be able to create any documents. We'll skip the order and send you an email telling you that we can't create the transaction because the inventory items are not found. We can create the item for you in QuickBooks Online, but the inventory start date will be the date of the first document that we create. This may affect the dates for some of your reporting periods. We can also use a default inventory item for all of your Amazon SKUs. 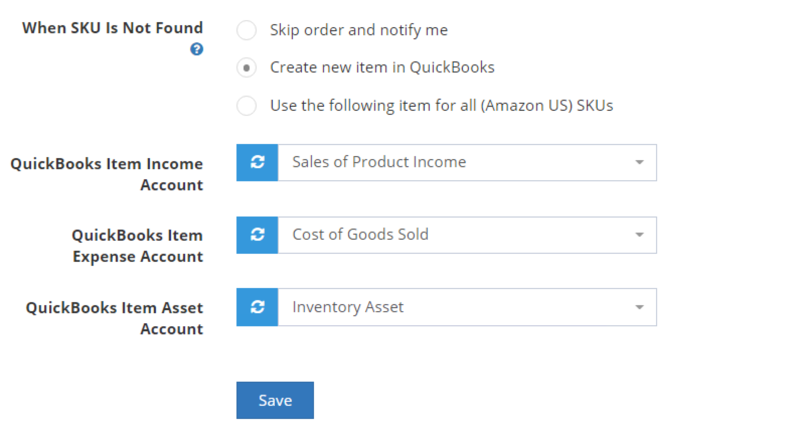 Create the item in QuickBooks Online and then type it below in the field after you've selected "Use the following item for all SKUs". If you create the QuickBooks Inventory item under Sales (or Invoicing) > Products and Service, you'll have to retry import once you've created the inventory item. If you have a lot of inventory that you need to map, you can also upload a list of inventory items under the SKU Mapping tab.